Advantech Industrial Automation Group recently launched 1-port Modbus Gateway EKI 1221D and 2 - port Modbus Gateway EKI 1222D. 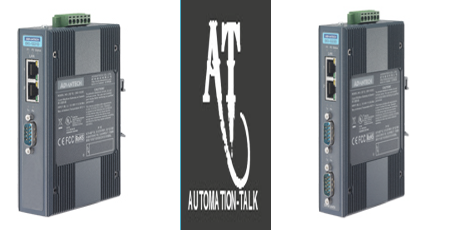 If you have existing Modbus Devices and you want to connect then in a network then here is the solution. These Modbus Gateways have two Ethernet Ports , out of which 1 can be used to connect to a Network and other Ethernet port to other Ethernet device or another EKI 1221/2D. <>EKI 1221D 1-Port Modbus Gateway<> It is a Bi-Directional gateway which can be used to connect all those devices which that can not connect to Network. This device provides an efficient way for remote management and Data accessibility. It has one serial port and it has unique feature by which user can select it to operate as Master or Slave. It also allows to set up Master at Ethernet and slave at seial and vice-versa and what more you can control Ethernet slave by serial Master OR serial slave by Ethernet master. <>EKI 1222D 2-Port Modbus Gateway<> It is also a Bi-Directional Gateways by Advantech but it has got two Serial Port. All other features and function supported by EKI1221D are also in EKI1222D. This 2-port device is meant for simultaneous connection with two Modbus supported device at the same time.It also Supports Ethernet auto-bypass function. Note :- The two Ethernet port on EKI122D have the same IP address. These products by Advantech provides the Remote Management of all devices which are unable to connect to a network. Master mode supports 32 TCP slaves at the same time and Slave mode supports up to 16 TCP masters. These Modbus gateways also have the unique feature of auto searching of slave ID over configuration utility. With all these most high-tech features packed in these Modbus Gateways ,these provide a cost efficient solution for Modbus devices Unable to connect to a Network.